Mekaku City Actors (メカクシティアクターズ) anime series - promotional video. The Kagerou Project (カゲロウプロジェクト), also known as Kagerou Daze, is a Vocaloid song series created by Jin (also known as Shizen no Teki-P). The story revolves around the Mekakushi Dan, a group of teenagers with unusual eye-related powers. An anime adaptation titled Mekaku City Actors will be directed by Akiyuki Shinbo and produced by Shaft will begin airing in April 2014. Shintarō Kisaragi is an 18-year old hiki-NEET who has not left his room in two years, engrossing himself with his computer and the internet. However, on August 15, due to the messing about of the cyber girl Ene, who lives inside his computer, Shintarō spills soda on his computer keyboard and is forced to go outside to buy a new one, due to the fact that during the Obon festival none of the stores will deliver until August 17. Shintarō goes to the department store, where a group of criminals break in and hold the people inside hostage for ransom. Here he comes in contact with a group of teenagers calling themselves the "Mekakushi Dan" (メカクシ, lit. "Blindfold Gang"), who stop the robbery with their mysterious eye powers and force Shintarō into joining their group. Before this occurs, Shintarō's younger sister, Momo Kisaragi, is a popular idol who has the ability to attract people's attention. This is due to the "Drawing Eyes" ability, which she cannot control and causes people to look at her wherever she goes. One day, while fleeing from a horde of fans, she meets the Mekakushi Dan leader, Tsubomi Kido, who invites Momo to join, which she does. While meeting the first four members of the Mekakushi Dan, Mary trips and gets Momo's phone wet, and they all go to the department store to buy a new phone for Momo. Kido uses her ability to keep people from staring at Momo, but while in the store, they find that Shintarō is there at the same time. The terrorists break in and take all the shoppers hostage, but Kido, Momo, Marry, and Kano are invisible and thus do not get caught. 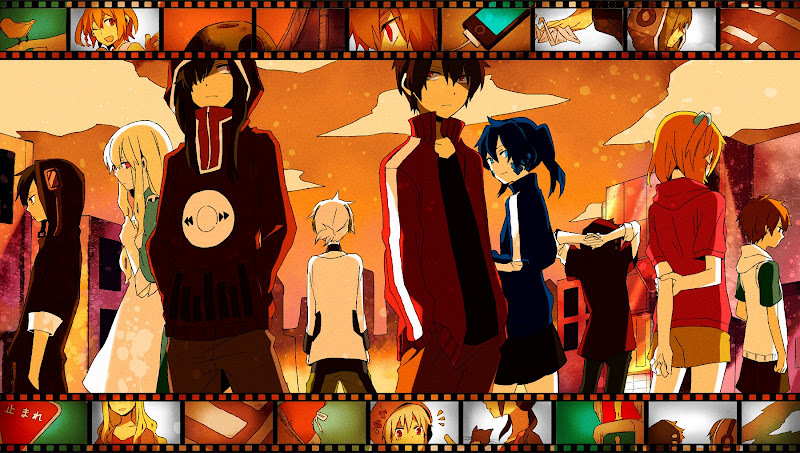 They work together to stop the heist, though Shintarō passes out, and they bring him to their hideout and introduce him and Ene as members once the former awakens. They all go to the amusement park and have fun afterwards. The prologue is told in the second novel, -a headphone actor-. Takane Enomoto and Haruka Kokonose, students of Kenjirō Tateyama, plan a class booth for their school's cultural festival. Haruka gets an idea to host a shooting booth; however this idea could not be fulfilled due to Kenjirō spending all their booth funds on a rare specimen. Takane, being a highly skilled gamer, decides that instead of a shooting booth with a large amount of equipment, they should make a video game of a first-person shooter. Kenjirō would be in charge of programming, Haruka was in charge of illustration and Takane was responsible for playing as the opponent. Their plan captured a great amount of attention, good and bad.